S. Korea's Hit Zombie Film Is Also A Searing Critique Of Korean Society : Parallels The film's themes reflect the strains of modern Korea: distrust of government and institutions, disdain for corporate leaders and a sense everyone's in it for themselves. Train to Busan is the first Korean movie of 2016 seen by more than 10 million people. It's also a critique of selfishness in society. A zombie flick is smashing box office records in South Korea. 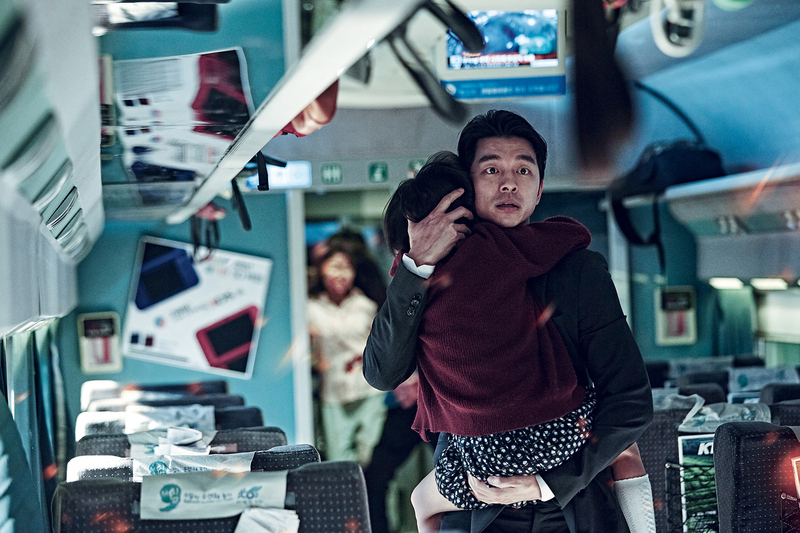 Train to Busan has been seen by an estimated 11 million Koreans — a fifth of the population — and broken numerous records, including the highest single-day ticket sales in Korean film history. The plot isn't complicated: Everyday South Koreans find themselves trapped on a speeding bullet train with fast-multiplying zombies, creating the kind of claustrophobic feel that freshens up the zombie trope. But beyond a fast-paced summer thriller, it's also an extended critique of Korean society. "We don't trust anyone but ourselves," says film critic Youn Sung-eun, who writes for the Busan Daily. Without giving too much of the story away, the film blames corporate callousness for the death toll. The government covers up the truth — or is largely absent. And the crew? Rather than rescue passengers, it follows the wishes of a businessman. Kim Su-an plays a little girl trying to get to her mother on an ill-fated train. In the film, those in charge — and the media— "are easily manipulated by others," Youn says, which she said is a message the film's director was sending about the institutions here. These themes are particularly resonant in South Korea, which in 2014 faced national tragedy after 300 people, mostly teenagers, died when a ferry overturned in the sea. Investigators found the ferry's corporate owners overloaded it to save money. And the captain and crew got into lifeboats without rescuing passengers. News media, toeing the government line, originally reported that everyone survived. The Korean president's whereabouts on that day are still unexplained. "After that accident, we have big trauma," Youn says. It didn't let up. Last year, as Middle East respiratory syndrome, or MERS, spread in South Korea, the government didn't disclose key information about where patients were being treated and how officials would contain the outbreak, instead demanding that people trust them. Outside a screening of Train to Busan in Seoul's Yongsan district, movie-goers like Wonwoo Park say they get it. "Korea changed a lot in the last few years. We have to recognize we are pretty selfish," he says. "And we have to change." While the message is clear, it's also just a fun summer flick, which probably explains its success more than its take on Korean society. "The movie was the first made in Korea about zombies," film-goer Sharon Cho says. "And the actors were good."